Now that I have had my hair made over and learned to use a flat iron I realize most woman want the hair they don't have. If your hair is straight you want curly. If its thick you want thinner and if its thin you want it thicker. I LOVE the fact that I have curly/wavy hair! I can wear it curly but also with tools have it straight. If it was the other way around it would be harder to go from straight to curly. There is a great book called Curly Girl The Handbook by Lorraine Massy. Its about a celebration of having curly hair! How you can take care of it, the different types of curls, which for me I had not thought about the variation of curls. There really are so many types of curls. Mine is more wavy down to curls on the bottom. But if I don't use the right conditioners and a blow dryer its curly and frizzy all over. Frizziness is probably the biggest complaint for curly hair. I have tried many things to fix it and some work some don't. I like how the book gives you at home remedies and tips for picking a hair stylist for your curls. I had not considered how a stylist can effect your curly hair. I have always thought as they are cutting it that its going to be shorter than they think since when it dries it curls up. Also how highlighting your can needs to be done with care and consideration of your curls. I loved how it said if you see someone with great curly hair ask them where they get it done, I would so do that! Another thing I had not considered is if a man has curly hair and the issues he might have. The book touched on that and what types of styles a man could get. Also included is a section on how to get your kids to love their curly hair. I think this would be especially helpful to a mom who doesn't have curly hair but her children do. 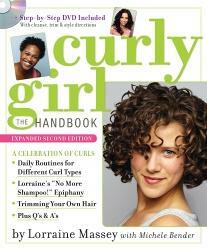 This book is really helpful and definitely a celebration of curls! The book is full of facts and tips with a CD included. The CD has step by step instructions on how to cleanse, trim and style your curly hair. This book would be great to give to a teenager with curly hair to realize your curls are awesome and many woman pay lots of money to have curls. We must embrace our hair because it is apart of us! You can buy this book at Borders or Amazon or better yet win it here! Workman Publishing has generously offered 2 lucky reader the chance to win a copy. This would be great for yourself or to give as a gift. Here is how to enter the giveaway. -Enter any of the other giveaways during the Moms Leaving the Workforce event and leave a comment on which giveaway you entered. +2 for every giveaway you enter. *Limited to US residents; 18 years old and above. Giveaway starts March, 23 2011 and ends on April 2, 2011 at midnight PST. Winner will be emailed and has 48 hours to respond before another winner is selected. I was not paid for this giveaway or post. I was sent a free copy of the book mentioned in the post from the publisher for my review.